Buffalo WR Stevie Johnson played in Jacksonville on Sunday, just one day after the sudden death of his mother, Rhonda Lewis, in California. She was 48. 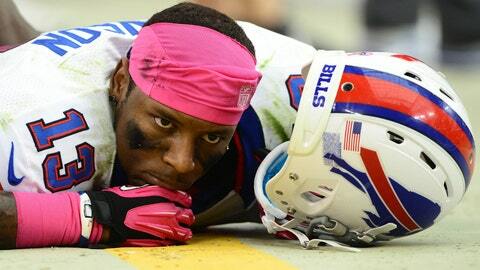 Buffalo Bills receiver Stevie Johnson could have flown home — and no one would have blamed him. Johnson’s mother died unexpectedly Saturday at her Northern California home. Rhonda Lewis was 48. Johnson and the Bills had already arrived in Jacksonville when he heard the devastating news. He sat down with coach Doug Marrone, who gave him the option of leaving or staying for Sunday’s game against the Jaguars. Johnson decided to stay with his teammates, and he opted not to tell any of them. "Whatever I can do to help out the team," Johnson told a small group of reporters in the hallway after the game. "I think I should give it my all no matter what. It was tough, but we got the win and I’m happy about that and I’m sure she’s happy about that." Johnson finished with one catch for 4 yards in Buffalo’s 27-20 victory. But he garnered praise from Marrone and his teammate for how he handled a difficult situation. I think I should give it my all no matter what. It was tough, but we got the win and I’m happy about that and I’m sure she’s happy about that. "It says a lot about Stevie that he decided to play," rookie quarterback EJ Manuel said. "We all look up to Stevie, especially us rookies on offense. He makes a lot of huge plays for us. He’s a difference-maker on offense. It was a matter of him not wanting to be a distraction to the team or for anybody to feel bad for him. He just wanted us to go out there and get a win." The Bills (5-9) scored twice in the final 2:14 in the first half to open up a 20-10 lead. And they answered on both sides of the ball when Jacksonville had chances down the stretch. "It’s a tough situation," Marrone said. "It’s a very personal issue. We discussed it. It was in his corner to say what he would like to do and then I have to make a decision whether I’m comfortable with that and he’s able to perform, which I thought he did." Johnson leads the Bills with 52 receptions for 597 yards and three touchdowns. With two games remaining, it’s unlikely he will reach 1,000 yards receiving for the fourth consecutive year. But that meant little Sunday — at least after teammates learned what he was going through. "It was something he kind of kept to himself," running back Fred Jackson said. "He didn’t want to bother us. We appreciate him. We appreciate him coming out here and fighting with us and doing everything he could."